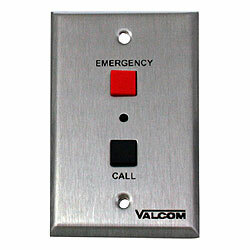 Valcom Emergency/Normal Call Switch with Volume Control is designed to be used with the V-2924A and V-2925A Intercom Units. Emergency button converts a single button press into the four switch closures required to generate an "Emergency" class of service call. Also provides an "Emergency" call-in signal (4 interrupted momentary closures) when the red button is pressed.